Written specially for local practitioners, the "Investor Relations Best Practice Guide" provides practical support to listed companies in the area of investor relations. It focuses on IR practices particular to Hong Kong as well as regulations and best practice in other parts of the world. The tips and suggestions are based on real-life experiences and provide clear guidance on the best steps to take in a variety of different circumstances. The guide examines the role of IROs, the stakeholders they serve, and the partners they work with. In doing so, it addresses some of the unique characteristics of the Hong Kong market. It also takes a detailed look at the tools IROs use to communicate investment proposals and build comprehensive IR programmes, as well as providing valuable practical tips every step of the way. The book targets to Investor Relations practitioners, corporate senior management and board, IR consultants, financial PR, company secretary, business and finance students, finance journalists and professionals and academics who are interested in the IR profession. 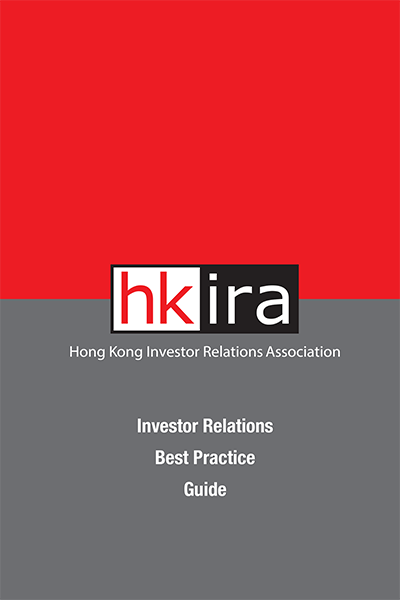 The book provides a comprehensive introductory to the profession of investor relations, and better understanding of the work nature and this young industry in Hong Kong. It also helps the readers to learn practical tips on IR day-to-day work, and improve hands on IR management skill.